It is drizzling. Of course it is. The damp air smells of metro fumes and a hint of Terre d'Hermès as I painfully drag my suitcase up the stairs and onto le boulevard Saint Michel. I look around. Red lipstick stands out against the gray sky. It is drizzling. Of course it is. The damp air smells of metro fumes and a hint of Terre d'Hermès as I painfully drag my suitcase up the stairs and onto le boulevard Saint Michel. I look around. Red lipstick stands out against the gray sky. Brown leathered footsteps resonate on the shiny pavement. I pull my collar up... and smile. 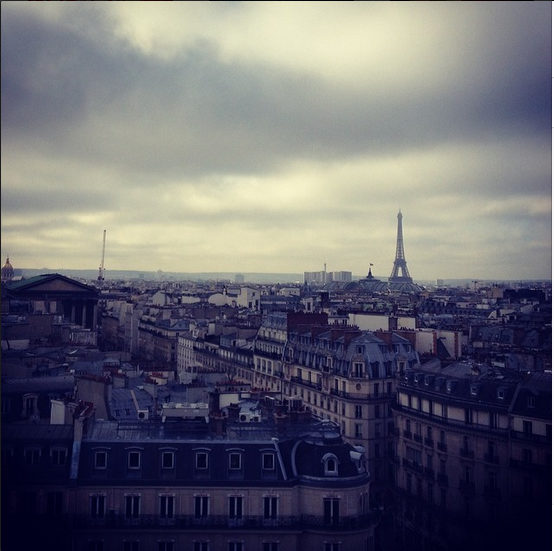 Only in Paris can a cold and rainy April day be romantic. To live in Paris as a young man is to be poor, cold, and in love. To climb six flights of stairs to a chambre de bonne with squeaky floorboards and lavender sheets. To read poetry over a stranger's shoulder during rush hour on la ligne six. To walk past three boulangeries to the one at the far end of the quartier with the better croissants. To forego dinner for a hot baguette and a good bottle of wine, and heating for an evening view of the Seine from inside mon chéri's coat. Up la rue Saint-Julien le pauvre, to the right, then another right. There are two faces I love huddled over a table by the window of a tiny café. I tap at the glass. Smiles, hugs, and tears. I am no longer cold. An extra glass for me, fresh bread, and some chèvre chaud sprinkled with rosemary and thyme. Et pour finir, un espresso with a chocolate coated almond. Our weekend in Paris has begun. We walk. Up cobblestone streets and narrow steps. Across bridges and through gilded archways. Into smelly cheese shops and out of crowded Thursday markets. Past the queue of ignorant tourists outside Ladurée and toward the infinitely better Pierre Hermé. Our flânerie includes the traditional stops: Boulinier for a pile of secondhand books, twenty cents each. Georges Larnicol for a bag of artisanal chocolates, half of which 'tasted' before leaving the store. Angelina for brunch. Léon for mussels and fries. Notre Dame for solace. The rooftop of the Centre George Pompidou for the view. La place des Vosges and la place Vendôme, for the reverie. Then come the discoveries. La librairie Jousseaume, tucked away in the Passage Vivienne. Colette bought books and writing paper here. I buy a postcard. Le musée de la vie romantique, with its satin green shutters overlooking a secret daffodil garden. Chopin plays in the rooms where artist Ary Scheffer once hosted the great romantics of the nineteenth century: Delacroix, Rossini, Sand, Gounod, Tourgueniev, Dickens. Right across on la rue Chaptal, the most exquisite assiette des embruns at the restaurant la Clairière. Monsieur Hermet cooks, Madame Hermet brings out the plates and the hot bread. After lunch, an afternoon at l'hôtel particulier Jacquemart-André. He, a wealthy Bonapartist Protestant. She, a Catholic royalist he commissioned to paint his portrait. They married, traveled the world, and turned their house into a museum. I shamelessly eavesdrop on a tour guide explaining Caravaggio's 'Boy Bitten by a Lizard.' Then, un thé courtisane in the elegant café downstairs. Before we know it, we have walked the weekend away. 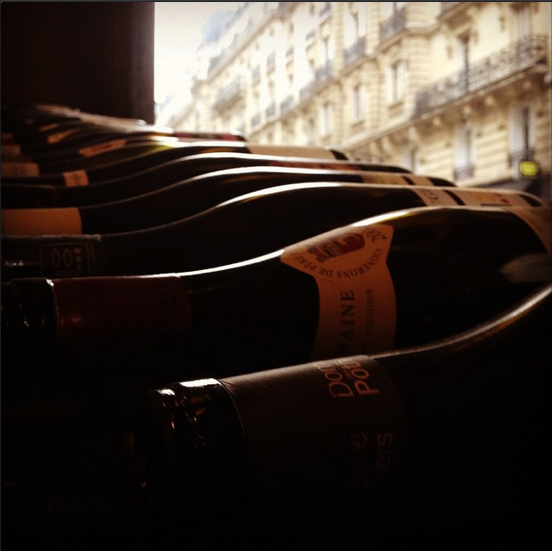 If a trip to Paris should end, let it be with an evening at Le Quinze Vins on la rue Dante. It is cold enough for a glass of cabernet franc; the conversation turns to philosophy. 'To exist is a fact, to live is an art.' And Paris is where you learn it. In 1948, surrealist painter René Magritte produced a peculiar little painting of a man's body with a floating balloon for a head. I am reminded of it every time I visit this city. Perhaps because it is, appropriately, called l'art de vivre.. The art of living. There is no single definition of that term, but my favorite is 'a true Renaissance appetite for life.' For food, wine, art, culture, history, music, philosophy. It is to walk around a city with your head afloat. To experience a moveable feast. A weekend in Paris is not enough. Nor is a year, or a lifetime. But I was lucky enough to have lived here for a while, and I agree with Hemingway: it does stay with you for the rest of your life. Besides, I'll be back. One more café-croissant express, then I head for the plane. This post was originally published under the title On a Moveable Feast on the author's personal blog, Aristotle at Afternoon Tea.